Enter your email address below to subscribe to knitchicks!. You'll be notified weekly about new groups and events. Knit in the rnd evenly for 25 rounds. round 30: * K9, K1 * around. Pull tail to inside & shape stem. My goodness! This is so cute. My 2 year old daughter will look cute on this! Can you give the type or weight of yarn so I can substitute a yarn that is more available to me? Sorry folks ~ am now reading comments and realize there is a correction noted. I'll try that and thanks for the person who submitted. I'm struggling with this pattern. I am a beginner knitter but when I got to the green leaves my pattern is off. The pattern starts 1 green then 9 red but with 72 stitches does that mean I end up with 2 red at the end of the round. I did that and I am now on round 28 and pattern doesn't look right to me. Look forward to any help. I would also like to know how to make this for an adult! any suggestions? Hats off to Kate! Very nice work. Love the colors, and love the little "twist" on the stem. I just made this hat for my nephew and wanted to thank you for the pattern. It is adorable! oh and if you want to convert it to an adult size , just use bigger needles or yarn and always use multiples of 8..so I made an adult size and used 96 stitches around, and then made it a bit longer before starting the leaves...worked out great!! this was my first hat I used the ann norling pattern, and added the litle seeds, it was pretty easy until I got to the green and had to switch to DP needles (first time using them) but I did it, and it is SOOOO cute!!! I made it purple instead! O.k. I don't get it. I'm a beginner, so forgive me. You mean to knit a row, then purl a row for 25 rows, right? Isn't that the seed stitch? That's what it looks like. Am I right? I'm at the spot now when you add the next color. I'm wondering if I continue on with circular needles or do I switch to 4 dpn now? In teh photo you are holding a lamb. I made this when I was pregnant with my son. The hat looks wonderful its just a teenie weenie bit small for my newborn. I probably will make another slighly bigger one. So cute! I knit one of these up in about four hours last night. I have enough yarn left over to make another one, and will be doing so tonight. I am selling these hats to benefit my son who had a double lung transplant. I will make any fruit or vegetable you chose. The cost is $20.00 with free shipping. That is so cute!!! Can anyone give me the finished size (I'm not a knitter but I can sew one!)? Basically, I just need circumference and height. Thanks. I switched to DPNs after round 34. My circular needles were 16" in diameter and at that point the knitting got too tight! You'll definitely need DPNs Kristen, so don't be intimidated. After round 36 you should have 18 stitches (and not 16) remaining. I'm also making a larger version of this hat for a 2-year old. I'll post the changes to the pattern if it works out! Is there a switch from circular to DPNs, or can the whole thing be knit on circulars? I'm a little intimidated by DPNs! Hi, all! Eilene, someone above has answered that question for you so look at the answers. Something about a bigger needle size, I hope this helps. I've made this as a tomato and an eggplant with my own colors and both hats are absolutely GORGEOUS! Hello, is there a conversion for adult size to the Tomato Hat? I don't really tie them in knots. I just pull the two pieces of yarn closed tight and then weave my ends in and there is no problem. I also don't switch to dpn's until it is uncomfortable for me to knit (ie, it is too tight to pull each stitch). HTH, email me if you want more info. 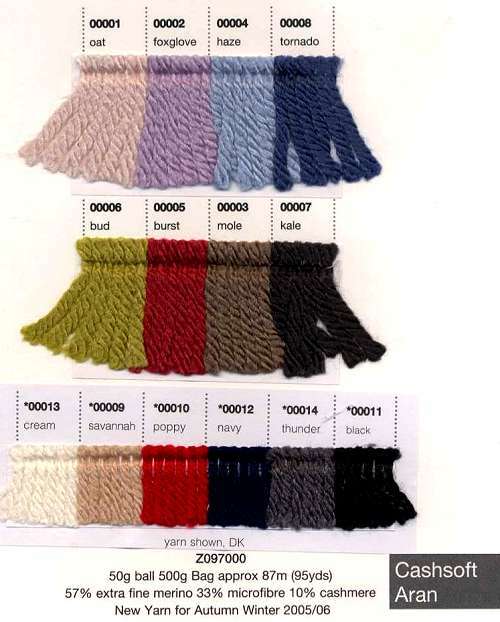 Which method did you use to join the different colours of yarn. My baby hat is looking pretty messy on the inside. I don't think the baby's head will appreciate all of the knots. Any advise appreciate! Hi! I bow down to you folks who have the time and skill to knit such beautiful things. I absolutely love the tomato baby beanie. Anyone looking to sell one? not sure how to bring in the green and am i supposed to switch to dpn to make crown? please let me know as currently stuck after doing the first 25 rounds. thanks. Do I need more than one skein (85 yards per 50 gram ball) of each? I'd like to buy 3 child's and 8 adult beanies. Anyone selling? Hey there. I figured out the adult conversion. Just use size 8 needles instead of 6. It comes out great. I jsut knitted these up - thankyou for the pattern - I did however knit a few extra rows cause it was going to be way to small and looked like a pipmle on a pumpkin - IYKWIM! Scroll down a couple posts. I posted six months ago that I had photos, but I just gave a link to my blog in general, and those pictures are long gone from the front page. Love the pattern - my first hat. But I didn't get the swirl in the leaves with the pattern -- the SSK fell at a different point for me. Did anyone else have the same experience? I love the hat and look forward to making it. If I were you I would remove FUNKEH comments. They were unnecessary and rude!!!!! Grow up FUNKEH and learn to spell. Do I use DPN or circular needles? Is it 4.5 circular or DPN? Just checking to be sure I have necessary supplies to begin. Love the pattern! Ever hear of Ann Norling? Search it. isn't a SSK when you slip 2 stitches (hence the SS) and then knit the 2 slipped stitches together?? that's what my vogue knititng book says, and that's what i did in this pattern--and it worked. I just got to the point where I start to add in the green, and I can't make the pattern come out properly either. I wasn't sure the change suggested in the comments would work either, but that may be a math issue on my part! I'll keep trying - the hat is adorable. I loved the hat. i made it but put little seeds on it so it looked like a strawberry! Round 30: K7, K1 around (a repeat of row 29). 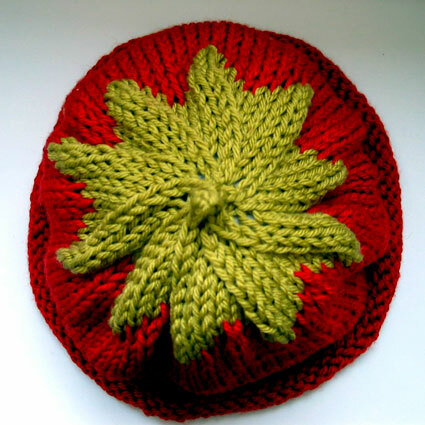 The one with the changes resulted in a hat that looked like yours, the original pattern created a ragged and misaligned leaf segment. Let me know if you would like pictures of the hats as examples. Anyhow, the hats are absolutely darling, and quick to knit up! SSK (slip, slip, knit) is a left-slanting decrease. Also known as slip 1, knit 1, pass slipped stitch over. What does the abbreviation 'SSK' mean? Thank you for short explanation! This is so cute!! I am going to knit this for one of my directors of my play. Her baby boy would look adorable in this! 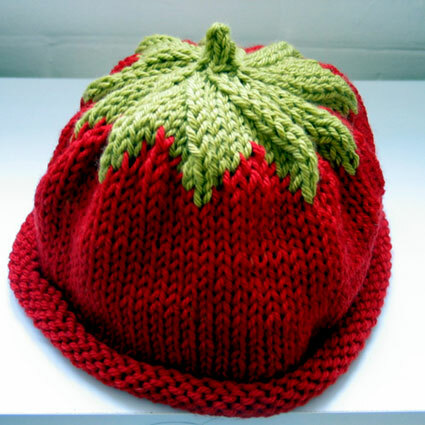 How do I convert this tomato hat pattern into an adult size? I'd like to knit it for my brother in law whose a gardener, he'd love it!